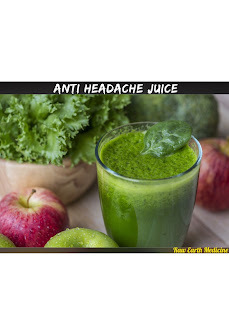 Best cold pressed, Anti Headache Juice is as powerful as taking two Advil. The high water content paired with the nutrients in the vegetables and bioactive compounds in ginger have powerful benefits for your body and brain. Gingerol is the main bioactive compound in ginger, responsible for much of its medicinal properties. It works as an anti inflammatory as well as a pain reducer. The combo of ingredients creates increased circulation and reduced inflammation with the increased blood flow helping to reduce the cause of headaches which is inflammation and restrictive blood flow in the blood vessels in the head/brain that causes the ache. If you suffer from headaches this should be a Juice you add to your daily nutrition to prevent headaches from happening. Once you have a headache you can drink this repeatedly until the headache reduces which should happen in a few servings of the juice. Consistent consumption of anti inflammatory over the counter medications (NSAID) may pose dangers to the heart, kidneys, bone and even hearing. Studies have found that high doses of NSAIDs increased risk for heart attack and other heart problems by one third; ibuprofen, in particular, more than doubled the risk of a major heart problem. A recent study involving 10 million people found that those currently taking an NSAID had a 19% higher risk of being hospitalized for heart failure. Don’t fall victim to over the counter quick fixes that hurt you down the road and let Anti Headache Juice naturally help your body fix the cause of your headaches without creating further problems!